Fresh are one of those brands that I have Instagram to thank for – I’ve seen so many bloggers tag them in images and rave about this cleanser in particular. I have their caramel lip balm which I use religiously, so was keen to test out some of their skincare products. I bought the cleanser in the small size so that I could test it out before getting the standard tube – it’s also doubled up as a nice little travel cleanser! It’s got a really mild cucumber scent to it, and removes all the rubbish from my face after a long day. It’s the kind of cleanser I’ve been reaching for when I just want something really gentle and soothing – I feel like every skin type could get on board with this one. It’s just a really welcome addition and also contains Amino acid which always help to make my skin feel healthy and renewed. 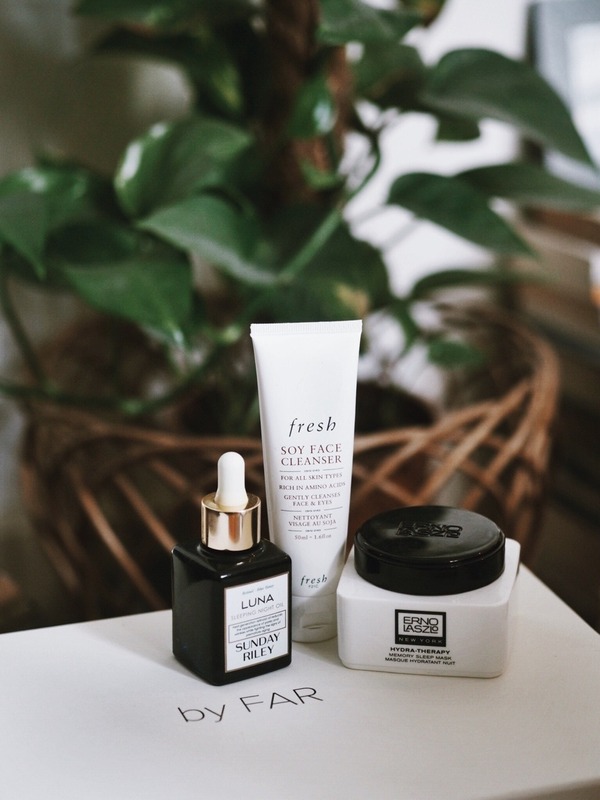 A skincare brand that I had never heard of until I was kindly sent some samples a few months back – they have now become some of my most used products. This mask is honestly like nothing else I have ever tried before, and I’ve been through my fair share of masks! I happen to be a big fan of sleep masks in particular – I like a product that works away whilst you sleep, and I still get excited that my skin might dramatically transform overnight with each skincare label promise. I’m a sucker for anything that feels cooling and nourishing before I hit the pillow – this mask has a jelly like consistency and helps to restore skins moisture overnight. It basically does exactly what it says on the tin, and looks really pretty too – it’s that millennial pink colour (v on trend), and I always look forward to using it in the evenings. I use this twice a week to keep my skin smooth and hydrated – alternating between this and Luna Oil is proving to be a lifesaving remedy for all my previous skin woes. Granted it’s another spendy product, but it really does last and it hasn’t disappointed me like some other high end masks that I’ve invested in. I definitely feel like I’m not on the skincare bandwagon, as I hadn’t heard of any of these, so thank you for introducing us to them all! Definitely going to give the tan-luxe sleep oil a go as I can’t bear the fact that summer is officially over!